Unions have protested Gov. Chris Christie's pension reforms, but the court upheld part of the law Thursday. New Jersey's retired teachers, police officers, firefighters and government workers got some bad news on Thursday. Their pension checks will remain at 2011 levels. The state Supreme Court Thursday upheld a law that suspended cost of living increases for the state's public retirees. The pensions were frozen by Governor Chris Christie back in 2011, as part of a larger reform deal that also required some public workers to contribute a bigger chunk of their paycheck to their pension. Retirees sued, arguing that the increases were protected under a law that prohibits the state from reducing their benefits. But the Supreme Court ruled in favor of the governor, finding that COLA adjustments aren't protected, overruling an appellate court's previous decision. The COLA adjustments will remain suspended until the cash-strapped funds are in better shape, hitting a certain funding target. 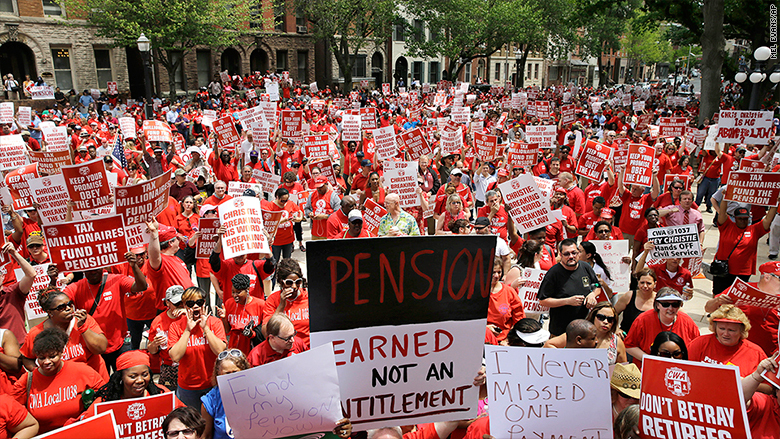 More than 770,000 workers and retirees are covered by New Jersey's public pension program. The freeze effects all kinds of public workers, including teachers, police, firefighters, and county and municipal workers. New Jersey's pension fund is seriously underfunded and keeping the COLA adjustments in place would "meaningfully worsen" the fund's liability, increasing it by 33%, according to Moody's. It's already in the hole by about $40 billion. But workers say the pension reforms were unfair. "These former officers didn't skip pension contributions, while the state continues to skip or underfund their responsibility," said Patrick Colligan, president of the New Jersey Policemen's Benevolent Association. New Jersey Education Association President Wendell Steinhauer said in a statement that he was "outraged" by the court's decision. "Our members were promised a COLA as part of their compensation, and they did the work required to earn it," he said.